This article is about how to use VeryPDF Photo to Flipbook Creator to convert photo to flipbook. VeryPDF Photo to Flipbook Creator allows you to produce flipbook from various photos, e.g., JPEG, PNG, BMP, TIFF, etc.. in multiple systems of Windows and Mac. The flipbooks from this application supports many web browsers, e.g., Firefox, Chrome, IE, Opera and Safari, etc., which can satisfy different users requirements flexibly. With this utility, users could save flipbook in computer or share it with friends in popular communicating websites, e.g., twitter, facebook, etc.. It is really worth your try! To add photos for conversion, please open GUI interface of this software, then click Input on GUI interface > radio Input Pictures, then there can be a panel popping out, where you should click Add > select photos in another pop dialog box > click open there. Finally, you can see selected photos could be added on this panel, and then, please click Save so that program takes you jump back to Input panel. And there you can optionally set output image quality and flipbook resolution separately and flexibly by clicking relative edit-box and typing right values there, etc., for example, anyway, you can try this software by yourself, then you will find how powerful this application is. Finally, please click Import so that VeryPDF Photo to Flipbook Creator helps you convert photo file to flipbook directly. After you get flipbook shown on GUI interface as below, flipbook background, toolbar and buttons color, etc., can be edited. For instance, to edit background picture of flipbook, you can click Picture on GUI interface > select one pattern that program provides you with, or click Add Local Picture > select one picture in dialog box Add Scene > click Open. Finally, selected picture can be shown as thumbnail under Picture. Then, please click one of added pictures and click Apply so that this picture could be applied in your flipbook background. Click Button on GUI interface > select one pattern of default ones under Button, then click Apply so that selected button pattern can be used in your flipbook tool buttons directly. To add local buttons into your flipbook, please click Add Local Button > select button patterns in pop dialog box > click ok there, then when it is successful to add local button, please click one of them > click Apply. Then, likely, this pattern could be utilized in flipbook toolbar, too. Also flipbook could be shared in popular social networks, e.g., Facebook, Twitter, etc., and you can try this function by yourself after you own VeryPDF Photo to Flipbook Creator. Then, you will find it is so interesting to produce a flipbook with this software! Then, please click one of radios in order to set targeting format as HTML, ZIP, APP or EXE. After that setting, you need to select right folder for saving flipbook later by inputting its directory in edit box Output Folder. 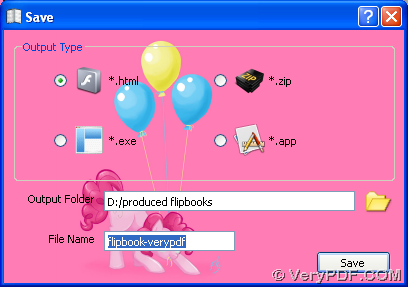 Then, you can choose to edit filename of flipbook and in the end, to make these setting effective, please click Save on this Save panel, at last, your flipbook could be stored in your computer directly. After you know how to use VeryPDF Photo to Flipbook Creator to convert photo files to flipbook file, to know more operation on flipbook production, welcome to visit user guide page to know more. This entry was posted in Flipbook Maker and tagged photo to flipbook. Bookmark the permalink.